Back in the late noughties, when we were photographing a large number of weddings, our bank manager advised us to use a local high street accountant, one of the largest in the area. Not wanting to risk harming our relationship, we took her advice. Our new firm of accountants had a string of offices, their website listed a multitude of specialisms ranging from Agriculture to Care Homes, Green Technology to Compensation Awards. Their services were just as varied. Auditing, Insolvency, Acquisitions, Forensic Accounting to name a few. It all sounded very impressive and you'd have thought with all their vast experience and manpower that we'd have received some top notch advice for our £1500 investment. Well, let's see. For a couple of years we were allowed to trade just above the VAT threshold meaning that we were, in effect, photographing several weddings each year FOC! In fact the only piece of advice we received was at the end of one of our meetings (added to the bill of course!). We'd arrived dead on time (as usual) but were kept waiting for 10 minutes in reception (as usual) with a thimble full of luke warm coffee. "We've had a chat in the office. We think more people are getting married so we think you should put your prices up." Really? And to think we were actually being charged for this. 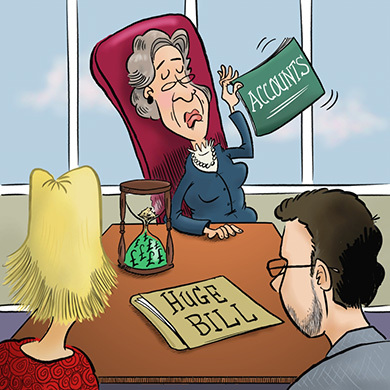 We've hired a few accountants/bookkeepers over the years with varying degrees of satisfaction. Our first was more interested in talking about his photography, our last didn't like to talk much at all. We couldn't help you much with Forensic Accounting, don't know much about Care Homes but we do know your industry. It's what we specialise in. We'll advise you throughout the year and this won't be based on having "had a chat in the office", it will be based on real life experience. We'll take a genuine interest in your business because we are genuinely interested.